Yesterday we made fabric rosettes. Totally simple. Totally cute. Today, we're going to turn them into jewelry to give as holiday gifts! We left off yesterday with some almost done rosettes. Now we'll finish them off depending on what we're using them for. 1. Cut a bit of scrap fabric or felt into a square slightly larger than the width of your rosette. Apply a generous amount of hot glue to the underneath side of your rosette. 2. 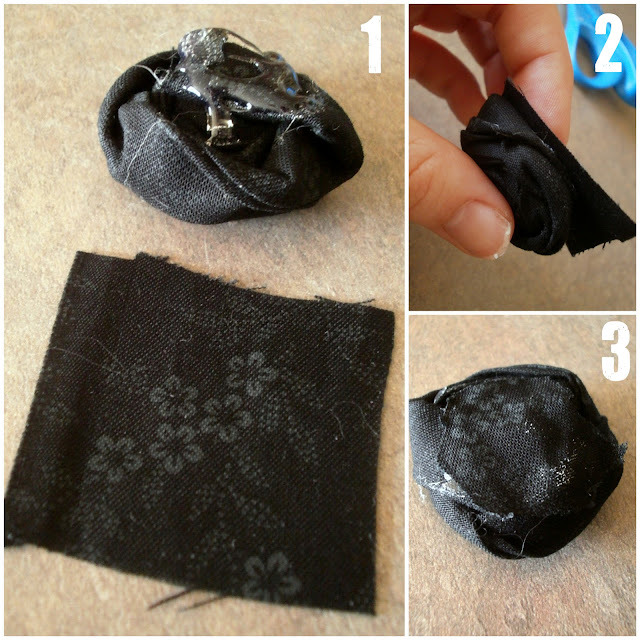 Press the scrap fabric onto the hot glue to adhere. 4. Find the center of the ribbon. Apply hot glue to the underneath side of a finished rosette and press onto center of the ribbon. 6. Repeat with all remaining rosettes. As you can see, even though I put my rosettes as close as I could onto my ribbon, when I tie it around my wrist, there are still gaps between them. If it doesn't bother you, you can always leave it like this. Or you can fix it with a little more hot glue. 7. Place a dot of hot glue on the side of the rosette (near the bottom so it doesn't squish up and out) and push the rosettes together. This will eliminate all the gaps between the rosettes and the bracelet will hold it's curved shape. And there you have it! A pretty rose bracelet to give as a gift, or wear yourself! 1. We'll start by gluing the rosettes together first. Apply a dot of hot glue on the side (near the bottom) of the rosette, and press rosettes together to adhere. 2. Once they're all glued together, cut a bit of scrap fabric slightly larger than the size of the rosettes (like you did in step #1 of the bracelets). 3. 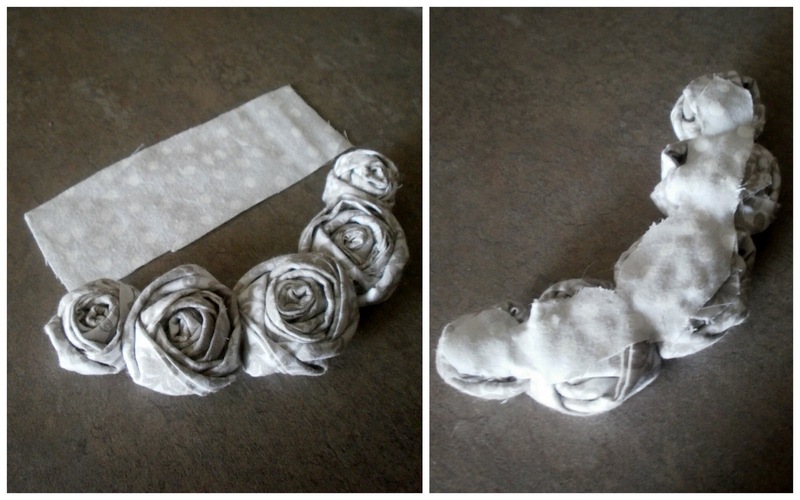 Apply a generous amount of hot glue to the back side of the rosettes, and press the scrap fabric onto it to adhere. Trim away any excess fabric and glue down any loose edges. 4. Now it's time to add the chain. I used a very thin link chain that I found in the jewelry section of the craft store. This kind works perfectly because it cuts easily with just regular scissors. No need for wire cutters or any special tools. Loop the chain around your neck and adjust until you find the length you want, then cut. I made mine long enough to go over my head so I didn't have to mess with clasps--it ended up being about 20" long. 5. Apply a dot of hot glue on the backside in the center of the top rosette. Lay one end of the chain into the hot glue. 6. 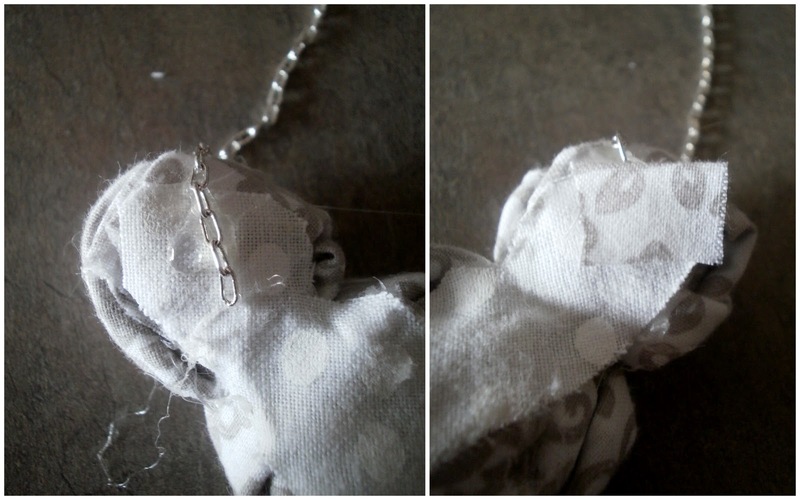 Cut a tiny scrap of fabric and lay into the hot glue over the chain and press to adhere. This will keep the chain secure in the glue, and also give it a nicer finished look. 7. Repeat with the other end of the chain on the other side of the rosettes. 8. To give it a little pop of color, I added a bow onto my necklace. Tie a piece of 1.5" satin ribbon into a bow, adding a little dot of hot glue under the center loop (kind of tucked inside) to keep it from coming untied. On the back of the ribbon, add a dot of hot glue and press the chain into it right above the rosettes to adhere. And there you have it! A gorgeous necklace that any girl would love to get as a gift! 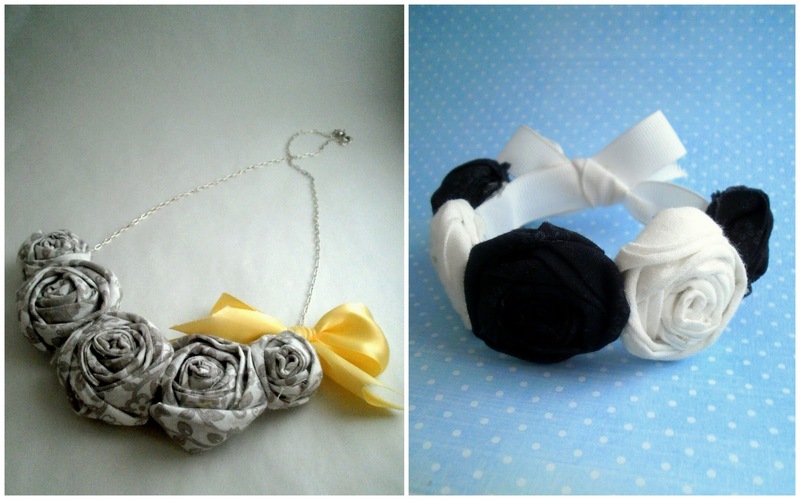 Need other ideas to use rosettes? Cluster a few together and glue a pin on the back to dress up that boring old cardigan. Add a couple to a tote bag to brighten up the look. Attach some to a headband or hair clip. Go crazy with them, adding them to everything you can find! Cute necklace! I glued a bunch of tan, green and red fabric rosettes to a fabric-wrapped wire frame last year to make a wreath!